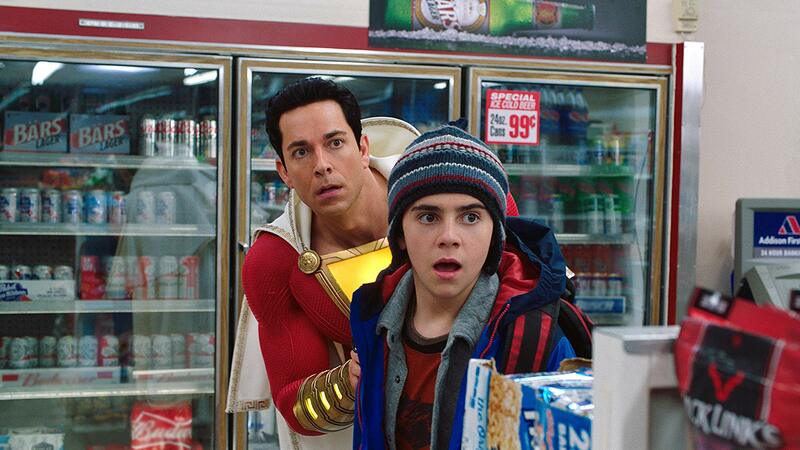 Light-hearted, goofy, and surprisingly dark to boot, Shazam! entertains in large part due to its childlike outlook. Young kids will spark to this film and the energy it exudes in nearly every frame. And I genuinely think adults will find it similarly appealing, not because it’s the type of movie most would say they’d love if they saw it when they were 13, but because this small-scale superhero journey coerces you into actually feeling 13 again. To be rebellious, raucous, and raunchy at an acceptable PG-13 level. Shazam! captures what it’s like to be that age without scaling its audience down to a single group. This is the kind of movie where young kids will experience primal fear, teenagers will commiserate with the characters’ trepidation, and adults will understand the deeper emotions stirring the scenes. Not many superhero flicks can make such a claim, or be this laugh-out-loud funny in the process. 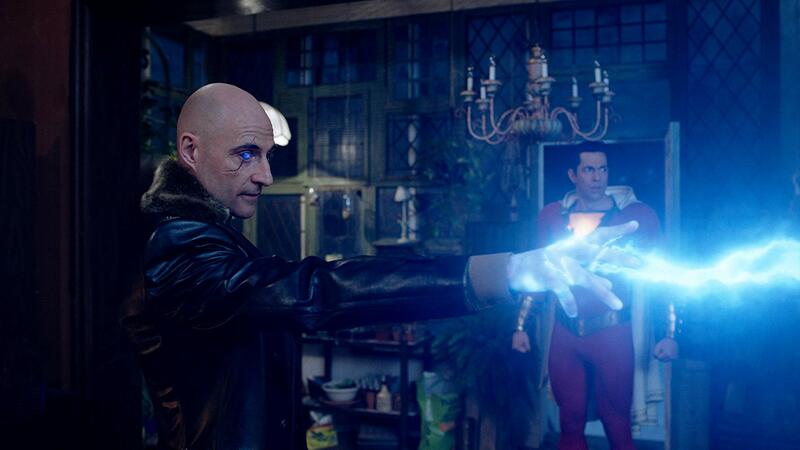 In a pleasant shakeup, Shazam! opts to open with an origin for its eventual evil antagonist, Dr. Thaddeus Sivana (Mark Strong). He’s a young boy who’s belittled by his Father and older Brother, mysteriously enters a different realm where a Wizard (Djimon Hounsou) deems Thaddeus unworthy of inheriting his powers, and the seed for vengeance is planted and well watered into adulthood. It’s a peculiar, dark, effective way to christen this superhero’s first film, introducing the story’s good vs. evil dynamics and setting the stage for what’s to come once the picture fast-forwards into the present day. And while these scenes are tonally disconnected from the rest of the movie, they at least lay a solid foundation for the rest of the structure to be built on. Enter Billy Batson (Asher Angel), an orphan who constantly searches for his Mom and runs away from foster homes without batting an eye. His latest stop is with Rosa (Marta Milans) and Victor Vazquez (Cooper Andrews), two good people already fostering five other kids. 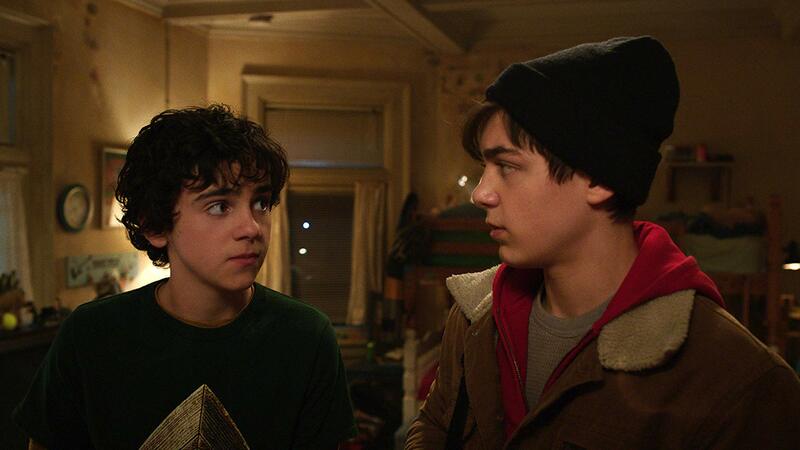 Billy is given the chore of rooming with Freddy Freeman (Jack Dylan Grazer), a superhero obsessive with a mouth fast enough to make up for his limping, arm-braced gait. The two are polar opposites. However, after Sivana acquires the powers of the monstrous seven deadly sins and plans to unleash havoc on the world, the Wizard must settle for his very last job candidate, who just so happens to be Billy. Transforming from a typical teen into a brawny, invincible superhero proves to be as terrifying as it is liberating. Appropriately billed as 1988’s Big with a comic book bend, Shazam! 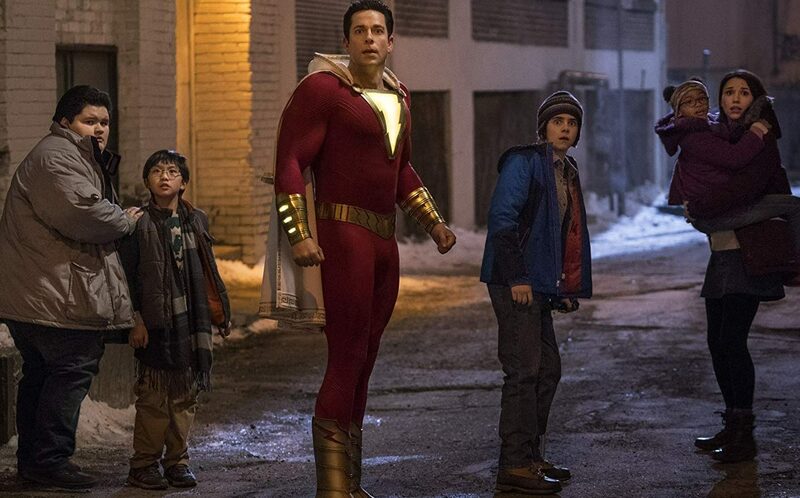 is at its most electric when the titular caped superhero (played by Zachary Levi with impeccable comic timing) is forced to ride this hulking new bike of a body without training wheels. Freddy’s there to conduct experiments and test Billy’s limits, as well as to record their hi-jinks and publish them on YouTube, the latter of which gets too little depth and adds weight to a film that’s already a little long without necessarily feeling tiring either. The movie’s main course delivers the goods though, showering in some great odes and homages to other DC characters and the late Penny Marshall’s body switching classic, substituting the Zoltar fortune-teller for an actual wizard and a secret song for a bullet that once bounced off of Superman, and best of all is a tip of the hat honoring that iconic piano number. 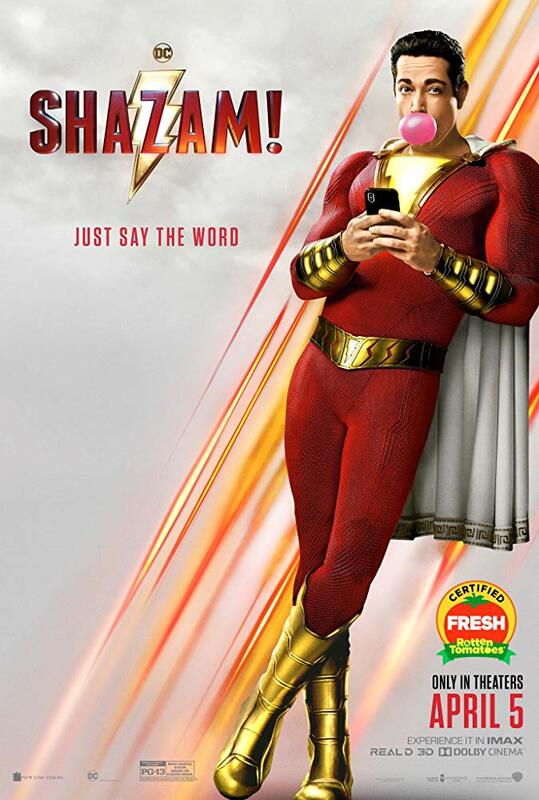 Similar to Big, the larger and branded Shazam! uses the superhero platform to tell us a story about identity and faith and family to great effect. In more ways than one, Shazam! reminded me of 2008’s Hancock in its visual style and buddy comedy tone. This is the better film of the two though, one that at least has a bad guy worthy of being taken seriously and bearing personal elements which lead to larger dividends in the long run. Most of all, Shazam! offers a great change of speed on an entirely new course for the DC comic universe. It proves their films can be heavy and extremely light, chaotic yet orderly, and downright serious while still being seriously hilarious. Director David F. Sandberg juggles the ying and the yang with great balance. I haven’t howled this much at a superhero blockbuster since I first saw Guardians of the Galaxy. And while it isn’t better than its comparable Marvel counterpart, this 80’s throwback might even be funnier. That’s saying something.